North Korea says it will send a delegation of high-ranking officials, athletes and a cheering squad to the Pyeongchang Winter Olympics in South Korea next month, during rare talks with the South. SEOUL - North Korea offered during the first formal inter-Korean talks in more than two years to send a delegation of high-ranking officials, athletes and a team of taekwondo and art performers to the upcoming Winter Olympics. The isolated state also has completed technical maintenance needed to reopen a military hotline with South Korea on the west coast, a South Korean government official told reporters on Tuesday (Jan 9), with normal communications via the hotline expected to resume on Wednesday. “The North side proposed dispatching a high-level delegation, National Olympic Committee delegation, athletes, supporters, art performers, observers, a taekwondo demonstration team and journalists” to the Games, which will be held in Pyeongchang next month, the South’s vice unification minster Chun Hae Sung told journalists. He added that the North Korean officials informed their South Korean counterparts of the military hotline before midday, less than a week after an civilian cross-border phone link was reopened. “Accordingly, our side decided to start using the military telephone line, starting 8am tomorrow,” Mr Chun was quoted by reports as saying. He said the North Korean side made no specific comments over international sanctions, reported Yonhap news agency. The South's Foreign Ministry said Seoul will consider lifting sanctions against the North temporarily in order to facilitate the visit of North Koreans to the Winter Olympics. On top of international sanctions imposed by the United Nations on Pyongyang for its missile and nuclear weapons programme, South Korea has imposed other unilateral sanctions on its neighbour. Among other measures, it bans several North Korean officials from entering the country. North Korea's state carrier Air Koryo is not allowed to land in the South. If Seoul needs to take “prior steps” to help the North Koreans visit for the Winter Olympics, it will consider it together with the United Nations Security Council and other relevant countries, foreign ministry spokesman Roh Kyu Deok told a regular briefing. Currently ships that sail from a North Korean port are also not allowed to dock in the South - posing a challenge to the Olympic organiser's suggestion to send a cruise ship to the North to ferry athletes over to the South, JoongAng Ilbo reported earlier. If all goes well, this will be the first time North Korea participates in the Winter Games in eight years. North Korea has competed in every Summer Olympics since 1972, except the 1984 Games in Los Angeles and the 1988 Games in Seoul, both of which it boycotted. South Korea suggested a joint march-in during the opening and closing ceremonies of the Feb 9-25 Games, which will be held in the South Korean city of Pyeongchang. The South Korean side also proposed proposed inter-Korean military talks to reduce tensions on the Korean peninsula and to hold reunions of separated families around the Chinese New Year's holidays which fall on Feb 16 and Feb 17 this year. Tens of thousands of families were separated by the 1950-1953 Korean War. That conflict ended in a ceasefire and technically the two sides remain at war. Tuesday's talks have fuelled hopes for reconciliation and broader talks to address North Korea's nuclear issue, although some analysts remain sceptical if the temperamental North will indeed send a delegation as promised. 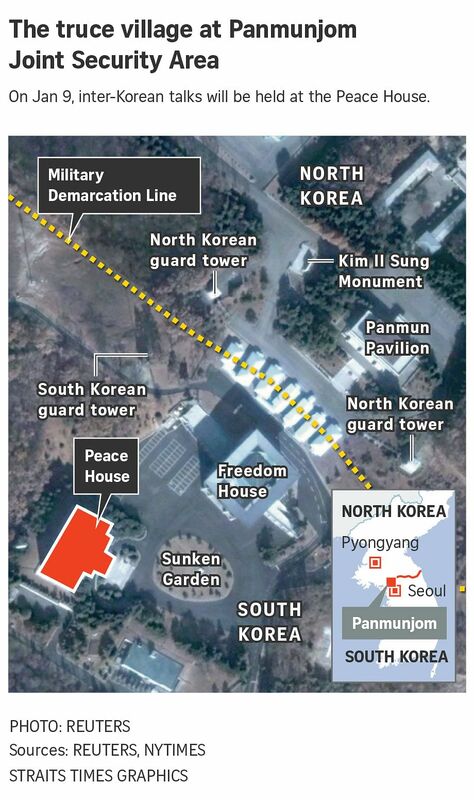 Tuesday's meeting started at around 10am (9am Singapore time) at the truce village of Panmunjom which is located in the heavily-fortified Demilitarised Zone (DMZ). Both sides sent a five-member delegation each. The high-level talks, which was held at the Peace House on the South Korean side of the truce village, was the first formal dialogue between both Koreas since 2015. North Korea's chief delegate Ri Son Gwon, chairman of the Committee for the Peaceful Reunification, said at the beginning of talks that he crossed the border with hopes that the two Koreas can show a "sincere and faithful" attitude during talks. He also hoped for "precious results" from what he called the "first gift of the new year". South Korea's chief delegate, Unification Minister Cho Myoung Gyon, was cited as saying in response: "A good beginning is half the job done. I hope we can hold the talks with determination and persistence." The two delegates shook hands and posed for photos before going into talks. The closely watched talks came a week after North Korean leader Kim Jong Un extended a rare overture to send a delegation to the Olympics during his New Year's Day address. Both Koreas reopened a border hotline on Jan 3. Reports say that cameras and microphones were placed in the meeting room for top officials in Seoul and Pyongyang to listen in on the discussions in real time. Is North Korea running rings around the South? The Straits Times understands that the main meeting including all delegates ended after an hour. It was followed by a smaller-scale meeting that included Mr Cho and other delegates. Tuesday's talks are highly watched for signs of any change in North Korea's nuclear stance, and if its participation in the Olympics can pave the way for an improvement in inter-Korean ties and lead to broader talks for nuclear disarmament. Inter-Korean relations froze in late 2015 over North Korea's rampant nuclear and missile tests, which triggered a series of toughened sanctions imposed by the United Nations Security Council. Both sides reopened a border hotline last week. South Korea suspended a tour programme to Mount Kumgang in 2008 and closed an inter-Korean industrial complex in the North's border city of Kaesong in 2016 in protest of Pyongyang's missile and nuclear tests. Experts warn that a resumption of operations at the Kaesong complex and of the Mount Kumgang tour project could violate UN Security Council resolutions aimed at curbing the flow of hard currency into the North. "The high-level talks can be called a success if North Korea agrees to join the Games and the two sides set the date for a next meeting and identify each other's stance over issues of mutual concern," Professor Yang Moo Jin told Yonhap news agency. The Kim Jong Un regime last fired its biggest and most powerful missile on Nov 29 which it claims puts the entire US mainland within range and declared its nuclear programme complete. The new South Korean government elected in last May, while maintaining tough sanctions against the North in line with United Nations resolutions, has always pushed for dialogue and reconciliation.